In one of my previous posts, I told you how much I am obsessed with my cell phone and how much I use it for various purposes and how I am being sometimes ridiculed for being too dependent or busy with it. Personally, I don’t see anything wrong in it. If I have spent some 25ks on my phone, I expect it to use fully and not just for the purpose of calling and messaging. Moreover, whosoever people who say this were not using any kind of smart phone. So, they did not have much idea how useful and addictive it can be. So, a month back, my friend got a Blackberry mobile. Previously, he was using a Nokia X2-01 which is good for conventional mobile stuff but nothing more than that. As soon as he laid his hands on this new phone, he has become a social media addict. He is using Facebook App which gives him instant notifications. He is on Whatsapp (btw, if you are not using Whatsapp on your mobile, you are missing a lot) with lot of friends around. And the most unexpected, he has taken Twitter hands on. I introduced him to Twitter a week back and the pace at which he is tweeting has baffled me. So, the crux is- he is totally into his cell phone these days. Entering the auto and exiting it, while in Metro, in lunch, last thing before he sleeps and first thing when he wake up- is his phone (even heard he is taking it to attend the nature’s call, I wonder what he does there- sh*t? tweet? Only he knows). And that too with the most basic Blackberry in his hand; I can imagine what his schedule will be like if he gets an iPhone or Samsung Galaxy series. He says he is now obsessed with this phone. I told him- my dear friend, you are just EVOLUTIONIZED. Isn’t it? It was an evolution. The way these smart phones shone to overtake the traditional mobile phones, coupled with the advent of social networks at almost simultaneous pace has been phenomenal. Bill Gates once said- “if you are not on the web, you can’t do business”. Now, for the younger generation, it is like- “if you are not on Facebook, you do not exist”. With these sites becoming such an integral part of our life, it was a tough ask to wait whole day to reach home and check what’s happening and get in touch with near and not-so-dear ones. Mobile phone makers saw the opportunity and the result is what we see every day. Facebook is now available 24 x 7 and so it is hard to be ignorant about anything latest. If you still are, then you need to run with the world. So, what is different? The different is the way people have evolved themselves to adjust to this lifestyle- both with themselves and around them. In my own family, I can see it. I adjusted pretty early to this change and got a cell that allowed me to at least read mails and blogs on the go, if not watch videos. Then I switched to a touch screen phone which was not 3G compatible. Now I have a Samsung smart phone which is more than good enough for everything you can do over internet. Videos, mails, blogs, social networks, chatting- I have everything. At the same time, my brother never got accustomed to these things. He was happy with a Nokia phone that clicked 2MP pictures and played MP3 music. 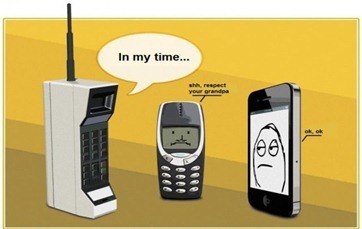 Now, he too has a Blackberry and he is also being evolutionized. I don’t see this evolution holding back in near future. Although it hard to think what else is left to innovate and techies to explore, you inadvertently know there will be surprises. iPhone 5 did it. Having that, in India, is a status symbol. Being a part of evolution of 21st century India, I guess!! And as days are passing by, I am seeing more and more people getting addicting to this. The age bracket of 18-30 has been breached. Even my father talks about getting a 3G phone and sign up to Twitter and Facebook (I dread that). My boss, almost nearing his retirement, got a, ahem ahem, Samsung smart phone with dual SIM facility. I sat with him setting up the basic stuff in his new handset and without doubt, I could see the child-like-glow on his face when he was trying them out. It’s amazing how a smart phone can bring out the kid in a 58 year old senior official. Evolution is certainly on and you can just delay it, can’t run away from it. That is inevitable. It’s not about whether, it’s about when. If you are reading this on your phone, then you are also evolutionized. If not, trust me, very soon, you will be.